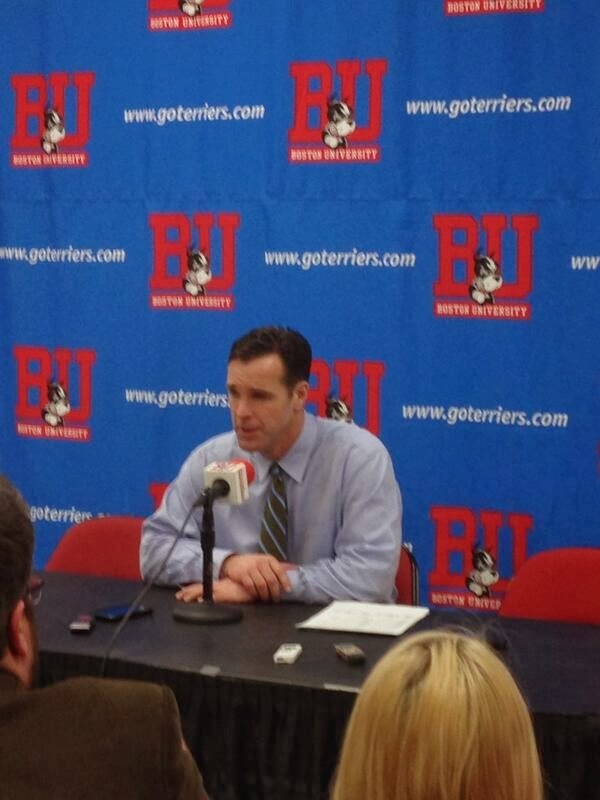 In David Quinn’s Inside BU Hockey chat with broadcaster Bernie Corbett this past week, the Terrier Head Coach David Quinn (photo) expressed his frustration with the number of games in which BU was forced to pull its goalie to try to tie a game. And rightfully so. In BU’s first 35 games, nine of 20 losses ended just that way. Three of the nine were one-goal losses; in six others (including two losses to BC), opponents scored empty-net goals making the margin two goals. So perhaps it was fate that, in this less-than-satisfying season for BU, the season-ending game concluded in yet another one-goal loss with the Terrier goalie on the bench. In last night’s Hockey East tournament one-game elimination, first-round game, BU came up a goal short, losing to Notre Dame, 3-2. Once again, it was case of too little, too late. The Terriers fell behind 2-0, before finally solving Irish goalie Steven Summerhayes, who shut out BU twice last month, late in the second period on junior Evan Rodrigues’ fifth goal of the season. Homestanding Notre Dame had scored in the first period, taking advantage of a defensive turnover and again midway through the second period. Early in the third period, the Irish regained a two-goal lead. Fighting to continue their season, BU pressed the attack and with five-and-a-half minutes left, freshman Robbie Baillargeon (photo), who had assisted on Rodrigues’ goal, scored on a power play after senior co-captain Garrett Noonan’s pass from behind the goal line found him in the high slot. In the final minute—with goalie sophomore Matt O’Connor on the bench—a breakaway opportunity for freshman Nick Roberto failed to produce an equalizer, and the Terriers’ season came to an end. O’Connor turned aside 26 of 29 Notre Dame shots. With a goal and an assist, Baillargeon finished the season as BU’s points leader with 27 and tied for the goal-scoring lead at 10 with sophomore Danny O’Regan, who led the Terriers in scoring as a freshman last season.. The Irish move on to the quarter-finals and will play BC, whom they beat last weekend. “I think one of the bright spots about having a tough year is that our young players had to play a ton. And because of that they’re going to be better sophomores and they’re going to help this team going forward. 2014 recruit J.J. Piccinich scored twice, including the game-winner, as Youngstown defeated Omaha, 4-1, to split a weekend series. With the two goals, the rugged right-wing has a team-best and league third-best 27, and became the sixth Phantom in franchise history to reach the 50-point mark in a single season. 2015 recruit Maxim Letunov contributed “an incredible spinning assist” on Youngstown first goal. Both of Piccinich’s goals were scored in tight quarters close to the Omaha goal, where he is most effective. 2014 recruit Jack Eichel rapped home a rebound for his 32nd goal of the season in the NTDP U18s 3-2 win over Cedar Rapids, completing a two game sweep of the Roughriders. Eichel, who now has a 32-35-67 scoring line in 39 games and is co-leader in points for the U18s, extended his latest scoring streak to 13 games. Earlier in the season, he had a 15-game scoring streak. Alex Chiasson scored his 11th goal of the season in Dallas’ 4-3 win over Minnesota on a night when the Stars retired all-time great Mike Modano’s number. After Chiasson gave Dallas a 2-1 lead in the second period, former Terrier Charlie Coyle’s power play goal tied the score. Matt Nieto scored his eighth goal of the season, a one-timer from the high slot, in San Jose's 4-0 blanking of Montreal. After a scoreless first period, BU erupted for three second-period goals to take a 3-1 lead. Sarah Lefort got things going for the terriers with her nation’s best 31st goal, followed less than three minutes later by freshman Rebecca Russo’s 10th of the year. After the Huskies cut the lead in half, freshman Maddie Elia the eventual game-winner (12th of the season), assisted by Russo (photo) and Kaleigh Fratkin, with just over a minute left in the period. Northeastern stormed the Terrier cage in the final period putting 13 shots on net. Kerrin Sperry stopped 12 of them and 42 for the game to nail down her 20th win of the season. BU goes into the title game with a 23-12-1 record. This will be the first time that BU and BC meet for the Hockey East title. The Terriers are 12-3 all time in the Hockey East tournament.